I’ve already told you about the wonders of mango jam, but mangos are pretty darn good the natural way too. The key is preparing it the right way to avoid getting the sticky sweet fruit all over you. And when you do it well you come off like quite the chef. To help you learn the technique and impress your friends, I’ve made a handy stop motion instructional video. Though I really just made it because I wanted to have an excuse to try out my newly downloaded copy of Windows Movie Maker. It’s no iMovie (I miss my Mac) but works. Hopefully this means more movies from me in the future. One of my biggest concerns before joining the Peace Corps in a French speaking country was simply my ability (or lack thereof) to pick up the language. I had just a handful of introductory French classes, plus a few hours here and there on Rosetta Stone before arriving, and I would not consider myself a language person. About half of the time in the first nine weeks of PC training in country is dedicated towards language study, and while I made the minimum standards to swear-in as a PCV, I only just made it. So seven months plus in, how is my French? Well, amazingly enough it’s fine. Not great mind you, I make grammatical mistakes practically every sentence and my listening comprehension is still worse than I’d like. But the bottom line is that even with all of the time I’ve spent with Americans due to the security situation and living in a regional capital with other volunteers and where others like to visit to resupply, I speak sufficiently well enough to express just about anything I need to express. I’m not having thrilling conversations, but I’m getting all of my needs met, and generally know what’s going on (though miss plenty of detail). 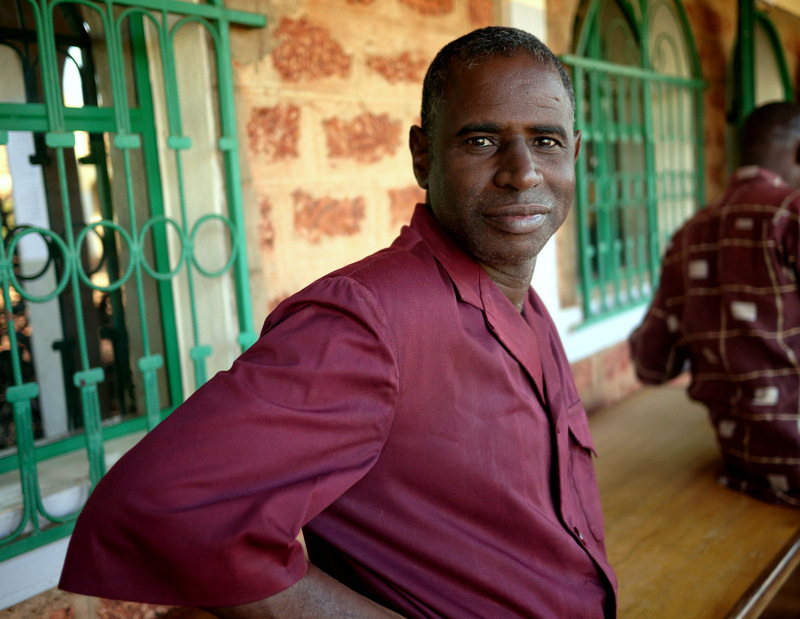 Saliou, my French tutor during training. And I’ve gotten to this point without a lot of serious study (post Peace Corps training at least). Now that I’ve given the natural technique some time, I have a new plan of attack to use rosetta stone, a local tutor, and make a better attempt to read in French to really get it down. I just found a copy of my favorite book, The Count of Monte Cristo in French. And while it’ll probably take me a few months to get through, and a dictionary constantly in hand, I’m determined to not leave this country without being able to read it. While I am getting more and more comfortable speaking French, my written French is terrible – it’s so laughably bad that at the bank I often cash checks for certain amounts just because I know how to spell soixante-dix (seventy) but not quatre-vingts (eighty) for example (though now that I’ve looked up this example for this post I think I’m good on that one now). One main obstacle in getting really good at French is the fact that the French spoken here isn’t like the French one would learn in France. In fact, if the person can even speak French, it’s probably their third or fourth language. Thus, there are a lot of shortcuts – few tenses are used, and many colloquialisms that probably wouldn’t get me very far in Paris, such as saying il y a quoi et quoi (literally, “there is what and what”) instead of the more normal Qu’est-que vous avez (“What do you have”) when asking a waiter what’s on the menu today. Other times, I’m not sure whether some uses are strange because I’m in Burkina, or if it’s just French generally. For example, no one really uses the nous (we) form, and instead use on (one). So for example, people say, on-voudrait aller a la marché (one would like to go to the market). It makes conjugating easier, but took me a couple of months to figure out that nous and on were used interchangeably. Also, many common expressions here would be considered rude in more classical French, such as saying il fait faire quelque chose (you must do something) instead of pouvez-vous faire quelque chose (can you do something) or je te demande le bidon (I ask for your bottle) instead of puis-je avoir ton bouteille (can I have your bottle). Grammatical quirks and vocabulary non-withstanding, I am just excited to be able to function in a non-English speaking society (and it’s pretty rare to find English speakers at all). And while I don’t think I’ll ever be able to achieve fluency here, I will be able to speak well enough to confidently navigate life and work. I’m happy to have the chance to learn a language that I can continue to use post Peace Corps, and hope to spend some quality time in France later on to continue my learning. My French progress was tested once again by the Peace Corps this month during a training, and I was happy to receive a score of “Intermediate-High”, one level above the score I received a few months back. Progress=good. No matter how well I learn French though, people love it when you speak to them in their local language, and here in the east it’s either Mooré or Gourmanchema. I’ve started to make more of an effort with my greetings, and there’s no better feeling than running through a series of salutations (i.e. Good morning, how’s it going? How’s the family? And your work?) and getting lots of surprised reactions and smiles. Next up is learning to order food. And as an aside I caught this neat infographic (and I love infographics) on business languages in Africa. So even if you’re a real language-phobe, there are plenty of English speaking countries to visit. Though be warned, I met someone from Ghana the other day and it took me a minute to realize he was actually speaking to me in English! Motos are ridden by almost everyone here, but per Peace Corps policy us PCVs are sadly unable to ride them. However, there are a few exceptions to the rule, and since I need to get to somewhat distant surrounding villages to meet some of the borrowers in my micro-credit organization, I can get permission to ride on the back of my colleague’s moto. 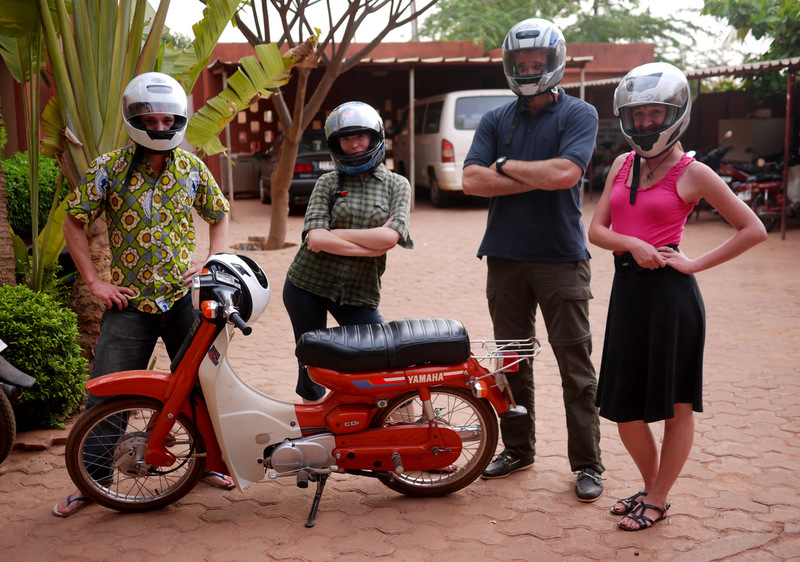 But before we can just hop on back at site, we got trained in Ouaga during a quick afternoon ride.